This week I’ve put a fabulous video together on Eyelash Extensions featuring before and aftercare of your eyelashes and eyelash extensions. I’m using the tips given to me by Cherrybomb as well as my tutorial on how I removed my makeup using lash shampoo. Please note I’m not a professional and you should always talk to your beauty therapist on the best care for your lashes. All my beauty treatments are completed by the talented team at Cherrybomb Vintage Parlour, where I have my eyelash extensions completed, I currently have the Russian Volume style lashes. I also have my brows, cut and colour completed by them. 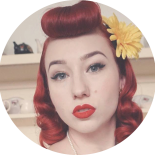 I hope you’re all having a fabulous week, I have so many exciting videos to share with you so it would be lovely for your to subscribe to my channel to keep up to date with all my vintage fun! This entry was posted on January 5, 2017 by Miss Lady Lace in Cherrybomb Chat, Pinup, Pinup Tutorials, YouTube and tagged 1940's, 1950's, blogger, cherrybomb parlour, cherrybombshells, glamour, miss lady lace, miss lady laces pinup blog, perth burlesque, perth pinup, perth pinup blog, perth pinup community, pin up, pinup, pinup blog, pinup blogger, pinup fashion, pinup girl, pinup life, pinup lifestyle, pinup perth, red lips, retro blog, retro girl, retro glamour, the perth pinup community, victory rolls, vintage, vintage blog, vintage blogger, vintage fashion, vintage girl, vintage glamour, vintage perth, vintage pinup blog.